This DesktopX theme was to be preloaded in DesktopX 4 on release. Brad has allowed for it's release now since DesktopX has been retired. 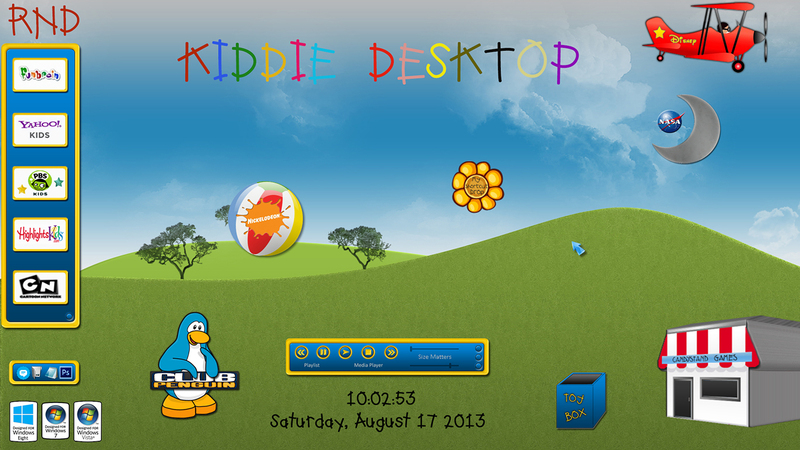 Kid friendly desktop. The objects lead to kid friendly websites when clicked. Some objects can be thrown, to bounce all over your desktop. The flower becomes a shortcut to the last file dropped on it. It can also be bounced around the screen. Scripts by sViz and 3Mo0. Works on Windows 8, Vista, and 7! Tested by Philly0381 and Wizard1956. Look here for tutorials on using my themes. Barb, you know I wish you could still get DesktopX. I mourn it's passing. Such a great concept. I'm glad you got to release it anyway. Gadgets....and Winstep, Rainy, Docks, WB....etc..